"Cottonwood", in the heart of Taos village sits back off the street behind a giant stone privacy wall and is surrounded by blooming lilies and ancient cottonwood trees in a most inviting setting. 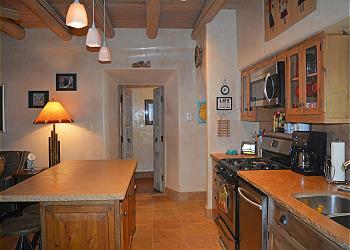 As additional interest, this Taos adobe vacation rental was owned by the same Taos family for over 150 years. In 2010 it was purchased and renovated by local "Taoseneo", Mr. Bob Loveless, nationally known for his award winning stonework designs for counters, sinks, tubs, showers, pools, privacy walls and about anything that can be made of stone. 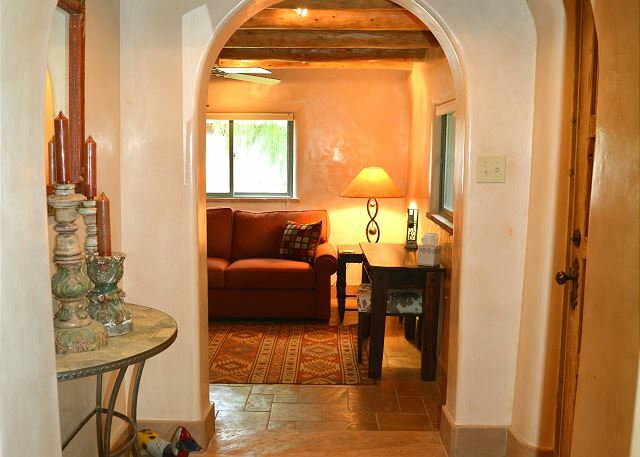 Bob's trademark stonework and artistic flair is evident throughout this popular vacation rental with arched doorways, curved abutments, stone and adobe privacy walls and adobe mica walls. 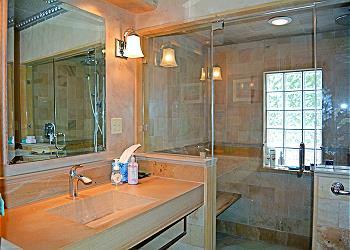 Cottonwood a one of a kind designer house with upscale charm and ambiance throughout. Surrounded by a thick stone wall and hundred year old cottonwoods, Cottonwood offers privacy, shade and seclusion in the very heart of Taos. With "two large master bedrooms" on opposite sides of the house each with their own bathroom two couples enjoy serenity and total privacy. There is additional sleeping for up to 3 more guests on the twin luxury memory foam sofa sleeper in bedroom #2 and 2 additional in the adjoining open den with double "state of the art" American Leather "Comfort Sleeper Sofa". When the den/bedroom is used for sleeping, bathroom for bedroom #2 becomes a "guest bathroom" with a second bathroom door opening from the great room, still enabling private access from the bedroom. 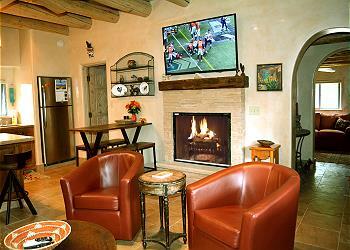 The great room, furnished with upscale sofa and leather chairs, offers ample seating for all. The open, upscale, contemporary kitchen is accented with "Loveless stone countertops", which is a signature in many large luxury homes around the country. 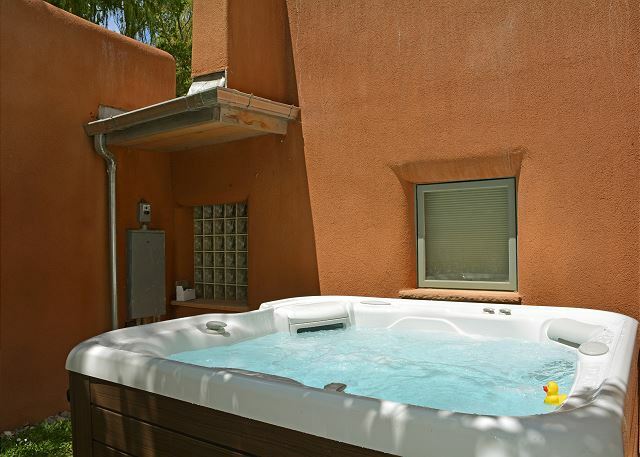 For total relaxation and unwinding, Cottonwood comes complete with a "Prodigy Hot Springs" hot tub nestled in its own private "coyote fenced" area for absolute privacy from the outside world. Coyote fences, native to Santa Fe & Taos, are constructed of Aspen tree limbs and are seen in the majority of southwest architecture publicity. The front "portal" (Spanish for covered walkway / patio) adds outdoor living space in all kinds of weather and comes equipped with small table, 2 chairs and 2 hammock swinging chairs, great for relaxing and socializing. During late autumn, winter and spring, Taos Mountain can be seen clearly through the Red Willows and Cottonwood trees. 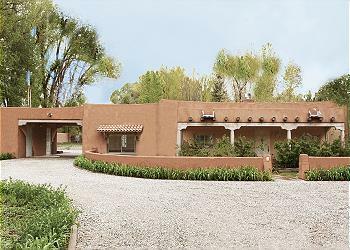 An adobe architectural work of art, Cottonwood offers a quiet retreat from the rest of the world and is an easy 3 block stroll to "Taos Plaza". Once there, enjoy Kit Carson's historic home, Bent Street, shops, galleries, museums and restaurants. Taos Inn's lobby and front garden patio is known as the "community living room" where Taos locals casually drop in to socialize with whomever might be there. Kit Carson Park, a half block further, is hidden and tucked in the center of town and is lovely for picnics, ball tossing and community festivals. There are 3 Flat screen Smart TV's (One in the living room and one in each bedroom). There is BlueRay DVD and a wireless scanner/printer/copier. For outdoor enjoyment there are 2 swing chairs, a zero gravity lounger, and 2 folding chairs on the front patio. There is a small table and 2 chairs on the back patio. 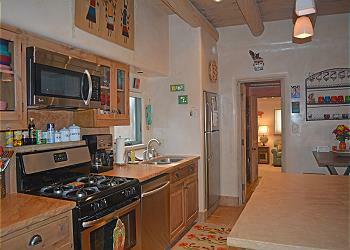 Vacation at upscale Taos Cottonwood and enjoy this easy "walk to town" location with spacious private setting in the heart of Taos New Mexico.